Two sets of stop lights are located near each other on U.S. 23. This recent photo shows vehicles turning left onto northbound 23, while the entrance of Stratford Road can be seen on the right. The Ohio Department of Transportation is expected to realign the intersection in 2016. 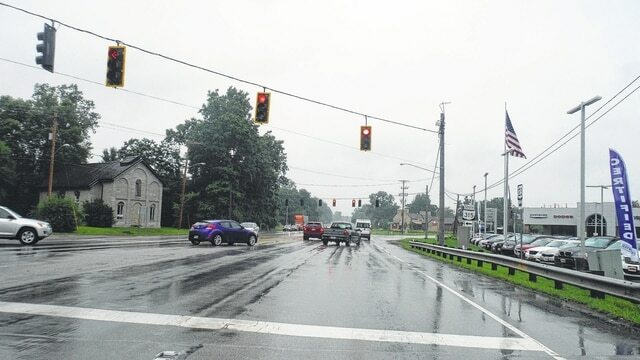 The intersection of State Route 315, U.S. 23 and Stratford Road is expected to be realigned next year, according to the Ohio Department of Transportation and the city of Delaware. However, litigation by Turkey Hill may change those plans. Currently, two sets of stop lights are placed closely together along U.S. 23 at both 315 and Stratford. Studies have stated the crash rate is more than twice the statewide average for this type of intersection. Since 2008, the city and ODOT have studied alternatives to make the area safer without widening the existing roads. The project, funded by ODOT, totals $3.5 million, Burton wrote. The city has managed the design, said community affairs coordinator Lee Yoakum, in an email. At a past open house regarding the project, some area residents and the Turkey Hill gas station/convenience store at 2740 Stratford Road opposed the realignment. Turkey Hill filed suit against the city in Franklin County Common Pleas Court, claiming false representation in the design that was ultimately chosen. Neither ODOT nor the city would comment further on the project due to ongoing litigation.